A BAFTA-nominated comedy about friendship and routines, set entirely in a police patrol car. Recently nominated for a prestigious BAFTA award and screened at the Toronto International and London Short film festivals, Charlotte Regan’s Standby is a short hitting the internet with a great deal of anticipation surrounding it. A touching, comical 5-minute film set entirely in the front seats of a police car, Regan’s short uses some clever editing to get her audience truly invested in the film’s main characters in such a brief run-time. 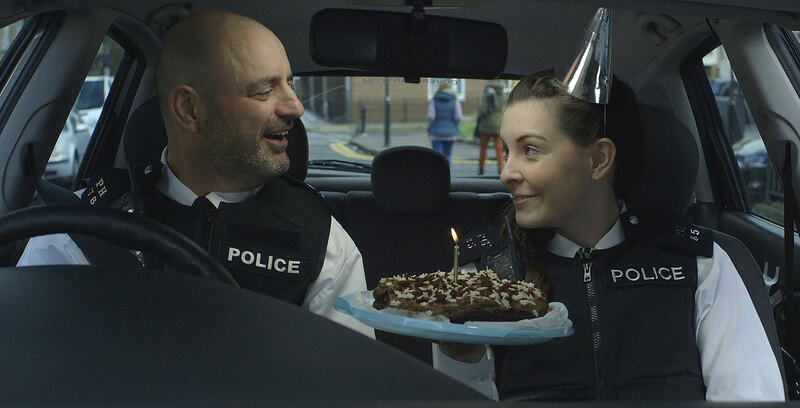 Created as the final film of her studies at Ravensbourne college, Standby tells the story of Police officers Gary (Andrew Paul) and Jenny (Alexa Morden) and how their bond develops as they spend more and more time together in their shared, cramped “office space”. Cleverly jumping through key moments in their relationship, the film takes you through the duo’s cold beginnings to their emotional “break-up”. Regan says the film was inspired by “dads that struggle to verbalise their love but show it so clearly in their subtle actions” and it’s certainly the connection between her two main characters (and the performances from her lead actors) that gives the film its impact – it’s a real emotional rollercoaster. A character-driven piece, it sounds as if the writer & director didn’t have to look too far for inspiration. “I’ve grown up around the most incredible comedic characters”, admits Regan, “every character in the film is based on someone I know or have met, the grandma in the back is based on my nan Helen who has more one liners than most comedians, the rapper Tyler is inspired by all the rappers I’ve done music videos for over the past 6 years, they’d sometimes offer you a playstation instead of paying the £100 they owe you”. Shot over two days with a crew of around 10, Standby is Regan’s first foray into narrative filmmaking, with most of the director’s experience coming from working on music videos (you can view more of her work on Vimeo). Encouraged by how this change in content meant she could focus more on dialogue and performances Regan has just completed her next short Fry-up and is looking to submit that to festivals, whilst also starting production on another short Kelly.